One of Britain's most senior judges has condemned the US over the detention of terror suspects at Guantanamo Bay. Lord Steyn said conditions at Camp Delta were of "utter lawlessness", in a speech seen by Channel 4 News. The Law Lord said the US was guilty of a "monstrous failure of justice" and challenged UK ministers to condemn the decision to hold any prisoners there. He said detainees were "beyond the rule of law, beyond the protection of any courts and at the mercy of victors". Lord Steyn's comments came as Australia said the US had agreed that two of its citizens at the camp would not face the death penalty, although they could face a military tribunal. British officials said the deal would not affect talks over two UK citizens also facing trial at the base. Lord Steyn said the nine British prisoners in Guantanamo Bay had been failed by the UK Government - even though a guarantee sparing them the death penalty had been reached. He is reported to have said ministers must condemn the holding of all 660 prisoners at the base, not just those from the UK. Lord Steyn quoted officials as saying: "It's not quite torture but at close as you can get." He said the quality of justice did not comply with international standards for fair trials. "It may be appropriate to pose a question - ought our government to make plain publicly and unambiguously our condemnation of the utter lawlessness at Guantanamo Bay?" 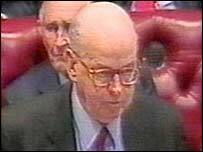 Lord Steyn said that the blanket order issued by President Bush had deprived the detainees of "any rights whatsoever". "As a lawyer brought up to admire the ideals of American democracy and justice I would have to say that I regard this as a monstrous failure of justice." It is rare for British judges to speak on contentious political issues and almost unheard of for them to attack a foreign government, BBC diplomatic correspondent Barnaby Mason said. Analysts said the Australian deal could be the model for a future agreement between Britain and the US. The Australian Government says its law does not permit the suspects to be tried back in Australia. But the BBC's state department correspondent Jon Leyne said that if they are convicted, there is a good chance they will be allowed to serve their sentences back in their home country. So far courts in the United States have ruled that they have no jurisdiction over the detainees since Guantanamo Bay is not American territory. However, earlier this month, the US Supreme Court agreed to hear appeals on the legality of the detentions. A ruling is expected by the end of June. Lord Steyn is the latest senior judicial figure both in the UK and the US to question the legality of the Camp Delta detentions and the way the war on terror is being prosecuted. The American Bar Association (ABA) last year expressed concern over the jailing of American citizens as "enemy combatants". And in August this year, the ABA urged Congress and the Executive to ensure that all defendants in any military commission trials have the opportunity to receive "zealous and effective civilian defense counsel". 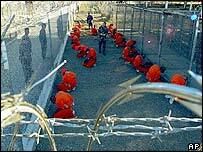 In September, the British Attorney-General Lord Goldsmith called on the Bush administration not to deny terror suspects at Guantanamo Bay a fair trial.